FAQ: How Do Your Storage Fees Work? Ahhh, good question. And as an eCommerce fulfillment company, this is a common one that we hear. Merchants want to know exactly how they’ll be charged to store their inventory in our fulfillment center. There is often confusion around this topic because the way that inventory storage fees work do vary from one company to the next. The most commonly-used methods for pricing inventory storage is to charge by cubic foot, by pallet, by SKU, or a combination of the three. So let’s go over these different methods and discuss their differences. Some fulfillment houses base their storage fees on the number of cubic feet that their items, or SKUs, occupy. To calculate cubic feet, you multiply the length, width and height of an item. Let’s say you sell books. One of your books measures 6 x 9 x 1 inches. In this case, the book is 54 cubic inches. There are 1,728 cubic inches in a cubic foot, which means that, if a fulfillment house charges by the cubic foot for storage, you would divide 54 by 1,728 to determine the cubic feet of your book, then multiply by the rate charged per cubic foot. Here’s an example. Let’s say a fulfillment house charges $0.30 per cubic foot for storage, per month. For one book, your fee would be 54/1728 x $0.30 = $0.009 per month. To store 1,000 copies of this book, your fee would be 54/1728 x $0.30 x 1000 = $9.38 per month. An important consideration with this model is if and how the fulfillment house rounds their measurements. For example, many companies will round up to the next full inch when calculating the LxWxH dimensions of an item. That can make a significant difference with your storage bill. It is also common to charge by the pallet for storage, rather than by each individual SKU. For example, a fulfillment house may have a monthly charge of $17 per pallet. The average pallet size is 48” x 48” x 48”, which is 110,592 cubic inches, or 64 cubic feet. So to store one book, your fee would be 54/110592 x $17 = $0.008 per month. To store 1,000 copies, your fee would be 54/110592 x $17 x 1000 = $8.30 per month. The average pallet size is 64 cubic feet; however, some fulfillment warehouses will use industrial-sized pallets, which measure 42” x 48” x 48”, or 56 cubic feet. Not all items fit neatly on a pallet. So even though, when calculated, it seems your 2,000 items will fit on one pallet, that may not be the case, and you may actually wind up paying for two pallets. Some fulfillment companies have low storage rates per pallet, but only allow one unique item or SKU per pallet. So if you have 10 SKUs, even though your total inventory may fit on 5 pallets, in this case you’ll actually be paying for 10 pallets worth of storage. A third common method used is to charge for storage by the SKU. For instance, you may have a monthly charge of $2.00 for each individual SKU you have in stock. This method may be used in combination with a per pallet storage fee. For example, a monthly charge of $2.00 for each SKU, on top of a per pallet storage fee of $17. It’s important to consider when storage fees are calculated. At eFulfillment Service, we charge storage based on end-of-week item counts. This method rewards our clients for items we receive and ship in the same week, essentially resulting in free storage for those items. This is not the case with all fulfillment companies, so make sure you have a good grasp on both how and when storage is calculated and charged, as well as how you can verify that the charges are accurate. Lastly, when researching fulfillment houses, it may appear in some cases that you have very little to no storage fees. It is not uncommon for some companies to bake storage fees into their “fulfillment” or “order processing” fees, so make sure to look at the total cost of fulfillment on a per item basis. Curious about our storage and fulfillment fees for your company? Tell us a little about your business and we’ll send you a free quote. Hi John, good question, and you bring up a good point that it does in fact cost the order fulfillment company money for that aisle space. It is common for fulfillment companies to simply account for that space with their storage fees. So for example, if a piece of bin shelving takes up 32 square feet of warehouse space, and there is an additional 32 square feet of space surrounding that shelving which is required for aisleway, the company will set their storage fees to cover expenses they incur on 64 cubic feet. This is a very interesting and useful exercise so thank you. Calculating monthly renewed storage on a cubic feet basis. Can you elaborate on the charges (cost)that would make up a storage fee? Would you include the depreciation cost of an asset (forklift, racking, etc.)? Would you include the cost for 24/7 security guard? Last question, would the cost calculation be different when calculating bulk storage as oppose to rack storage? Hi Michael, thanks for the comment and questions. Regarding the depreciation of assets and cost of security, those are operating expenses that we do incur, but when you outsource order fulfillment to eFulfillment Service, the nice thing is that, as an ecommerce seller, those are things you do not have to worry about. We also do not charge separate rates for bulk versus rack storage. We have always tried to keep our pricing as simple and straightforward as possible, without any tricky fees. If I am paying for storage on a per pallet basis, how is that calculated per month as the number of pallets will fluctuate daily with new arrivals and product being sent out? Thank you for your comment. And good question. With eFulfillment Service, you are not charged on a per pallet basis, which is the case with many order fulfillment companies. Instead, we calculate the actual inventory that you have on hand each week to determine your storage costs. This ensures that you do not overpay for warehouse space that you’re not utilizing. As we fulfill orders throughout the week, inventory will of course be depleted, and your storage costs will go down. We have a potential account that has asked us to warehouse and ship corrugated boxes by SKU for them. We have to provide the man power and equipment to provide this service. What is the best way of determining the cost per month, per pallet, etc. to receive, sort and re-palletize and ship their product? Thank you for the comment! You ask a great question. Effective warehousing and order fulfillment is ultimately a matter of appropriately and efficiently managing labor in combination with having the right technology and metrics. If this is a new order fulfillment job, you will likely have to make some assumptions based on time estimates and materials for each task. I am happy to provide you with more information. Please feel free to email me at sales@efulfillmentservice.com. Several companies in the area have asked us to store cardboard boxes for them (products we are supplying to them, but they don’t have storage – short term stuff). I can calculate space, etc. What I don’t know is what is a typical rate for this type of storage. None of this is flammable or explosive or radioactive; mostly promotional products. Thanks for the comment. That’s a great question. To help determine an appropriate storage fee, I’d recommend doing some research to see what local warehouses are charging on a per pallet or per cubic / square foot basis. Because the storage fees can vary quite a bit from market-to-market, it’d probably be most beneficial to actually contact some local vendors to see how they are charging, and then factor in your warehousing costs to verify if you can match or beat their rates based on your desired storage margins. I want to know what is different between the warehouse charge and storage charge? I’m a forwarder in Vietnam and can’t understand about this. That’s a great question! Here at eFulfillment Service, we use warehousing and storage fees interchangeably, meaning they’re the same. However, with some order fulfillment companies, they may have warehousing fees that are separate from their storage fees. For example, another fulfillment company may charge a “SKU management” fee, which could fall under their warehousing fees. In other cases, fulfillment centers will have inventory storage fees which fluctuate, depending on how long your merchandise has been stored in their warehouse. I know it can be a bit confusing. At eFulfillment Service, we try to keep it simple. We have one storage fee, which stays the same no matter how long your product is warehoused. We do not have long-term storage fees, nor do we have SKU management fees or any other warehousing charges. what would be the best way to charge when we have customers storing pallets and small boxes? One charge for all or charge more for the small pieces? That’s a great question. There are a variety of ways to do it. A lot of companies, because of the way their warehouse is set up, will charge for a minimum of one pallet position, even if there are just a couple of boxes on the pallet. This is done to ensure that half pallets or quarter pallets are generating the same amount of revenue, as it may not be feasible to combine those boxes with inventory from other clients, which basically means that, even though they only have a couple of boxes on that pallet, it still requires a full pallet position. In other cases, as is the case with our order fulfillment company, we charge based on the precise amount of cubic footage that the inventory occupies. This means that if one of our clients has just a couple of boxes of merchandise, they’re only charged for the cubic footage of those boxes….not for a full pallet position. 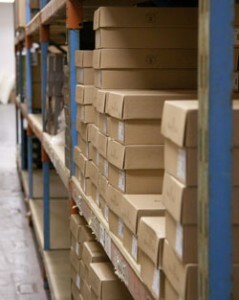 This is made viable by having multiple types of shelving to help ensure that space is not wasted within the warehouse. Please advise on the disadvantage to charge customers by per day vs per month. When it comes to charging for inventory storage by day vs. by month, as long as the method by which you’re charging for storage remains the same, the only disadvantage would be that some months have a different number of days. For example, if you charge $1 per day for storage, it would come out to be slightly more expensive for a 31-day month than if you charged $30 per month. Other than that, I do not see any disadvantages to how the storage fee is calculated. I charge by cubic foot. However, I need to convert my charge to pallets in accordance with few clients requirements. However, I have different sizes of pallets in terms of cubic inches/cubic feet. The pallet is standard size of 42″x48″, but the height differs depending on the cargo type. If I have the approximate volume of each pallet with a specific height, is it a correct method to average the pallet cubic size based on the percent volume of each pallet height? or is there a more efficient method based on your experience? Do you charge for the pallet volume, when calculating CBM rates? Ie: if my product is 20m3, will you add the m3 of the pallet beneath it to the total volume? Thank you for reaching out regarding how we calculate our inventory storage fees. This is a good question. If our order fulfillment clients send in a full pallet of merchandise, we will measure the pallet and bill based on the total cubic footage (not including the pallet itself). If our clients send in shipments that are smaller than a full pallet (i.e. – a few cases of product), then we’ll measure those cases or even the individual each SKUs to calculate the storage fees. This ensures our clients are never paying for warehouse space that they’re not actually utilizing.